In the age of television, movies and instant entertainment many traditional modes of entertainment are going towards sunset. In India, traditional art of story telling like Villu Pattu, Burra Katha and others are out of reach to most of the kids in urban areas and slowly in rural areas too. The only time I have seen Villu Pattu was on Doordarshan. Kamishibai , a similar such old form of story-telling based in Japan, has slowly gone the way of Villu Pattu and other traditional folk arts of India. In this story, Kamishibai Man is old now and thinks nostalgically about his good old days of regular rounds of story-telling to the kids. He decides to give it another shot for old time sakes. His wife packs sweets and he rides again on his bicycle after a long forced retirement to tell the story of Kamishibai. He feels totally out of place in the big, bad city; finally finds an old spot and starts his story. When he wakes up from his nostalgic reverie of story telling, he is surprised by a great response from the onlookers. Ironically, he even gets featured in the prime time television - the same entertainment media which had pushed him out of his job. Allen Say, the wonderful author and illustrator of such great children's books like Bicycle Man creates another great piece of nostalgia. Similar to the Bicycle Man, he again takes us on a great ride of his childhood days when the Kamishibai mode of story telling was common. While entertaining us with a wonderful story; he also gives us a small lesson in the times and history of Japan in a very subtle manner. A mark of a great story teller is the ability to mix all emotions and take us all along with him. 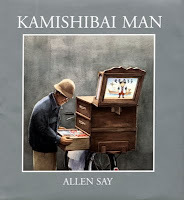 In this wonderful book, Allen Say, uses his words and even more powerful illustrations to take us on a wonderful journey of Japan around the time of World Wars. His subtle changes in the colors as he switches from the present to the past and a switch back to the present is amazing. I recommend this book wholeheartedly. Pick it up for your kid or just pick it up for yourself. You will not be disappointed. Also, do check out Lama Mani books - which is based on traditional story telling art of Tibet. Thanks for the review. Will chk it out from the library. The mention of traditional story telling and how it is now totally displaced by TV reminds me of the Tulika book Sweet and Salty. When I was reading the book, I could totally related to Bangaramma's excitement that Gorannagaru was coming to her village, but also felt sad that my kids can never understand it from the same plane. Very interesting indeed Sathish. And that a lovely review as well! Fwding this to my Japanese friend, bet she'll be happy! And Poppy, we don't have this one, but we do have a Japanese folk-tale called 'Just a Pile of Rice'. Awesome illustrations in that one as well. When are you coming over?! how many countless forms of story telling there are, and how few we've been exposed to! great pick from the region..
one of my fav books related to Japan (I have too many of them though :) ) is the book called CROW BOY - an amazing book. I found it in an second hand book shop and loved it. apologies, had to delete the earlier comment and re-comment again. Wow - what a moving review... No words to describe how touched I am by the various forms of story-telling around the world. Truly inspiring pick, Sathish! Thanks. Will check if they carry in my LL. Now to think of all the words I've learnt through this journey on ST.. Interesting pick Sathish and very befitting too - Asian and an almost extinct form of storytelling - well amalgamted and nicely laid out. I want to read this badly. what a lovely review Sathish. I want to pick this up now. You know the festival has made me go nuts, hunting for all the books you all have written about! Your penultimate para resonated with me, Satish. So very true. Thanks for another great book! Sathish....we read this book just last week. And it is a big big it with Akhil. Here's a boy, whom I was despairing of ever picking up a book and reading on his own, and after we read KM together, I've seen him pick it up several more times on his own and quietly escaping into it. The illustrations are you pointed out are simply striking and gorgeous and so moody!